Hey Ladies! I hope you are all well. I haven't posted a haul for a while so I thought I would show you some of the things I have been buying over the past few weeks. I bought some of these things with my birthday money and a few of the others were gifts. I went to Brisbane a few weeks back so my boyfriend treat me to this gorgeous double ring from an amazing jewellery shop called Lovisa. I walked into the shop and could of bought everything in there - there was four walls covered from top to bottom in amazingly gorgeous jewellery *heaven*. As you can probably tell from the jewellery I have accumulated, I am loving spikes at the moment. Anything spiked is a winner for me and I must get my hands on a pair of spiked shoes ASAP. I am also loving the peplum and dipped hem trends that have been popping up everywhere so I decided to treat myself to these two tops. I bought the RI one with my birthday money and I love it. 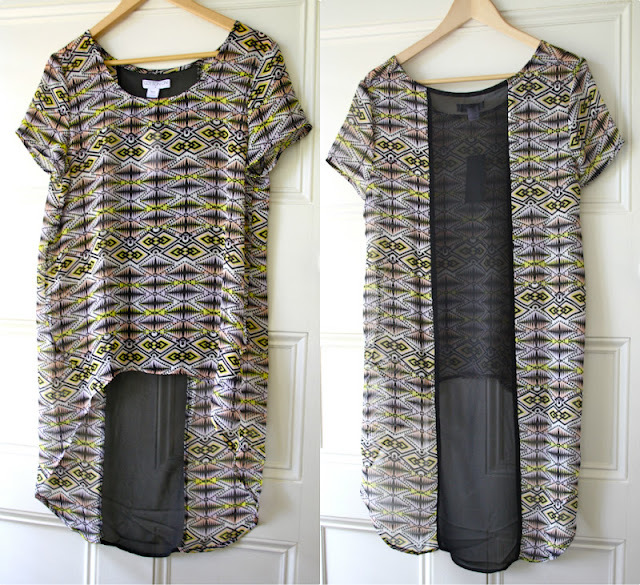 It is such a flattering shape and can be dressed up or down which is always a bonus. I will be wearing it this weekend as I'm going to Brisbane (again!) so look out for an outfit post featuring it. As for the dipped hem top, I loved it as soon as I saw it. I'm a bit mad on aztec print so it instantly caught my eye. I bought it from an Australian shop called Cotton On which sells really affordable and on-trend clothing and accessories. This top only cost me around £17.00 so I thought it was quite the bargain. I will also be wearing this at the weekend so hopefully I will get some pictures for an outfit post. I have also bought a few random beauty products lately that I didn't really need but couldn't resist anyway. My boyfriend bought me the body butters and Caudalie cleansing water as part of my birthday present and I bought everything else when I was in Brisbane or shopping at the supermarket haha. Is it just me that is always attracted to the 'toiletries' isle in supermarkets? Anyway, look out for reviews on all of these products as I have been really enjoying using them. Now my absolute favourite thing from this bunch has to be these gorgeous ankle boots. I have wanted some boots like this for such a long time so when I spotted these whilst shopping in Brisbane, I just had to have them. Me and the boy went half's on them (he's a good egg!) so I didn't pay too much and I just know I will get so much wear out of them in Autumn/Winter. They will go with almost anything! Yey!! So there we have it, my shopaholic tendencies got the better of me again. I will probably buy more in Brisbane this weekend - I just can't resist. I may as well make the most of it while I can though as I will be going on a strict spending ban when I return to the UK. Boo. Have you treat yourself to anything recently? The moisturising body oil is fab. I always use it when I'm trying to get tanned! can't wait to see a review on the dry shampoo! been looking all around volumizing one as well. Been treating myself to loads of beauty products this past few weeks. Personal highlight? The Real Techniques Core collection brush set I've wanted for CENTURIES. I must stop but I'm having too much fun. My obsession with beauty will never end. I love your haul!!! Could you make a review on palmer's oil? It seems to be a good product. Whoaaaa great haul! Love those boots and would LOVe to read a review on the palmers oil - I've heard mixed reviews! Wow, i've wanted some jewelry like this for ages! That ring is absolutely GORGEOUS. Waaa as always, in love with your fabulous blog. hope you're good. adore the coco butter body oil,makes my skin feel like silk! I am a shopaholic too XD haha... when I have money I spend it when I should be saving... I'm actually doing a new thing where I save 10% of my money and it works..
any how, the jewelry is my favorite part of this post! The spikey necklace is to die for! I'm really loving that dress, it reminds me of the prints people usually wear in my country (Guatemala). 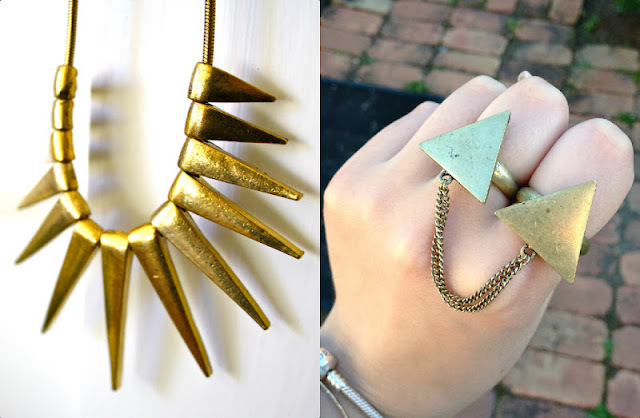 ooh I love those triangle connected rings so cute! 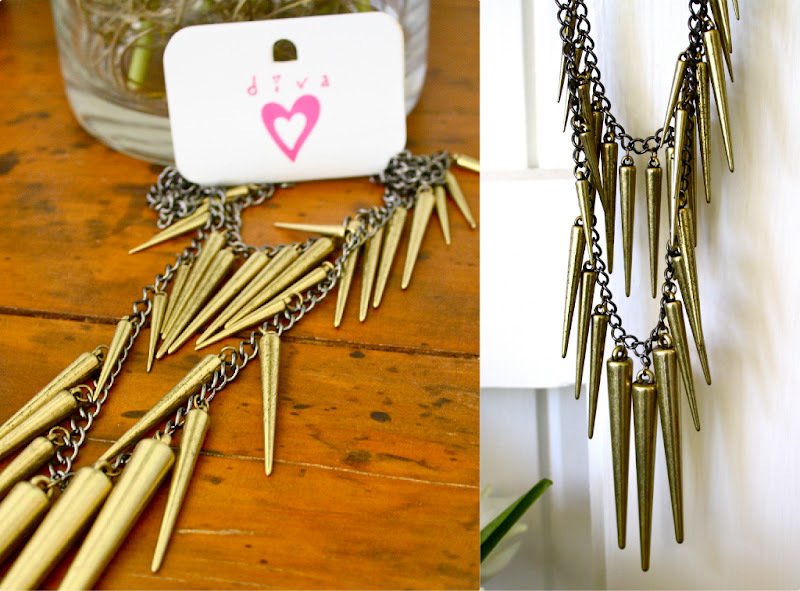 Oh wow, I think I actually NEED that spike necklace now... and I love the boots!